Post a design you have in mind for a character you're interested in LDing for the group, and we'll link it here in the OP. 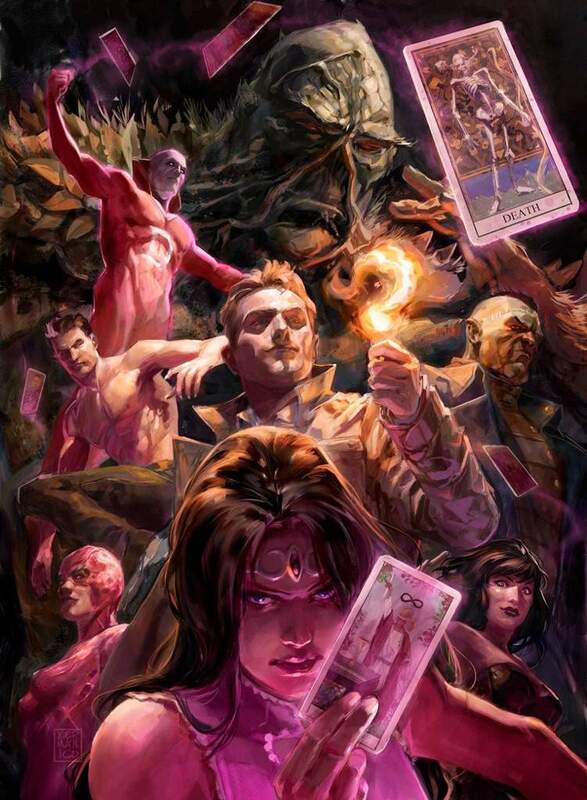 • Constantine can allow a 2nd d20 roll, taking the favorable result. • Zatanna II can alter a single combat, attack, or defense die rolled into a blank. Last edited by MrNobody; February 26th, 2019 at 11:03 PM. 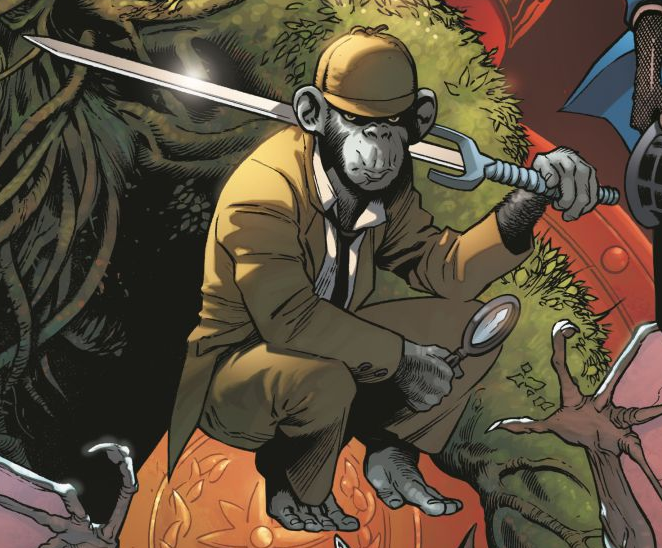 Instead of moving, Detective Chimp may roll the 20-sided die. On a 13 or above, you may choose and look at one unrevealed Order Marker on any card your opponent controls. When Detective Chimp attacks an adjacent figure with his normal attack and rolls at least one blank, you may choose and look at one unrevealed Order Marker at random on the defending figure's card. If it is an X Order Marker, remove it from that figure's card. Detective Chimp never takes falling damage and is never attacked when leaving an engagement. After rolling attack dice for a normal attack or after rolling defense dice, for each shield rolled you may immediately move Detective Chimp one space up to 6 levels up or down. When Detective Chimp rolls defense dice against an opponent's attack, one shield will block all damage. Really like the art in the OP. I'll take charge however I'm needed. I was actually just about to post anyways. Any thoughts on this as a power on Shade's card? Shade adds 3 to his attack and defense against Insane figures. After Shade rolls attack or defense dice against an adjacent Unique Hero, if you rolled at least 1 blank, you may choose an Order Marker on that Unique Hero's card. Switch it with an Order Marker on this card. Both players may reveal these Order Markers normally on their turn instead of their other Order Marker of the same number. At the end of the round, all Order Markers moved by this special power return to the player who controlled the Order Markers before they were moved. -The Madness Vest allows Shade to warp reality. That means he can do a whole bunch of stuff, but one of the main things he uses it for is "becoming" another person. I'm not sure of the exact logistics, but it's like he merges them, in both body and mind. He'll often even forget who he really is in the process too. -Are there any powers this will combo with too well? My first thought was Ozymandias, but I think that checks out. Shade can't trade the X for a numbered OM if Ozy has used the X already. I guess Loki (Or Loki+Ozy) could be a problem. -In the series, it's mostly shortened to "M-Vest." I want to keep it long though, because the Ditko Shade has another M-Vest, the Miraco-Vest, with different powers. I'd want to leave room for him if I or somebody else wanted to make it happen. It's Nightmaster's sword originally, but he died in Metal and Bobo wields it now. I would prefer something besides a 'one shield defense' power but the rest looks cool. T's point is that they are annoying and tend to be overdone. He is a chimpanzee but should that put him in the same class as a Flash? I’m also thinking that between Deadman’s current form and Madame Xanadu, the faction might have enough ‘look at OM’ powers already. I like Detectives having to ‘guess’ where the OM is and get a benefit from that. Nightmare Nurse has no mini, so we'll need a modded one for her. She seems pretty simple looking so that shouldn't be too hard. She could play a nice healer role for the team so I'd say she'd be a nice design to have. I'll try taking a stab at her or Madame Xanadu when I get a chance.